Squaw Valley was a scrappy, one-lift mountain in 1955 when it shocked the world and won the 1960 winter Olympics bid. Today, it’s one of Lake Tahoe’s premiere resorts, with 29 lifts, a 2,850-foot vertical drop, and a whopping 3,600 skiable acres—not to mention dramatic landscapes and thrilling runs that draw Olympic ski racers, World Cup champions and amateur daredevils alike. Note that lift tickets include access to both Squaw Valley and neighboring Alpine Meadows, but this guide will review Squaw's terrain and amenities. Squaw Valley is credited with inventing extreme skiing in America—shortly after the 1960 winter games, intrepid skiers started exploring the uninhabited valley, often hiking to more adventurous terrain. Expect runs here to be a little steeper and more challenging than other area mountains. Advanced: The KT-22 lift services some of the most epic and recognizable trails at Squaw Valley, and gives riders access to 2,000 vertical feet of steep trails, chutes, and cliffs. For incredible views of the lake, head down Granite Chief. Or act like a pro and schuss down Red Dog—it hosted the 2017 Audi FIS Women’s World Cup, and the ladies’ slalom and giant slalom events at the 1969 World Cup and 1960 Winter Olympics. Intermediate: Intermediate skiers and boarders can head up to the Emigrant lift and play on the blues near the Shirley Lake Express. Glades loosely separate this section into five trails with challenging pitches, each wide enough for practicing big turns and short enough to safely pick up some speed. To return to the base village, cruise down the three-mile-long Mountain Run, a diverse blue with a just-right mix of fast drops and corduroy cruisers (and the mountain’s longest piste). Note that the bottom part of this trail gets busy after the mid-mountain lifts close, and visibility turns flat when the sun ducks behind the mountains or clouds. Beginner: Beginner and low-intermediate skiers and snowboarders enjoy some of the mountain’s best scenery atop Big Blue, named for the panoramic view of Lake Tahoe. The wide-open run offers plenty of space for practicing turns and hockey stops; nearby Gold Coast offers slightly more challenging terrain for newbies ready to level up. First Timers: First-time skiers and boarders can get their mountain legs at SnoVentures, a bunny slope that’s just wide, long, and steep enough for mastering the whole pizza–French fry thing. Walk from the base village or take a free shuttle across the parking lot; shuttles leave every 15 minutes from the pick-up circle, located behind the clinic. Full-day adult lift tickets start at $129; two-day passes are available for $169; and season passes start at $599. 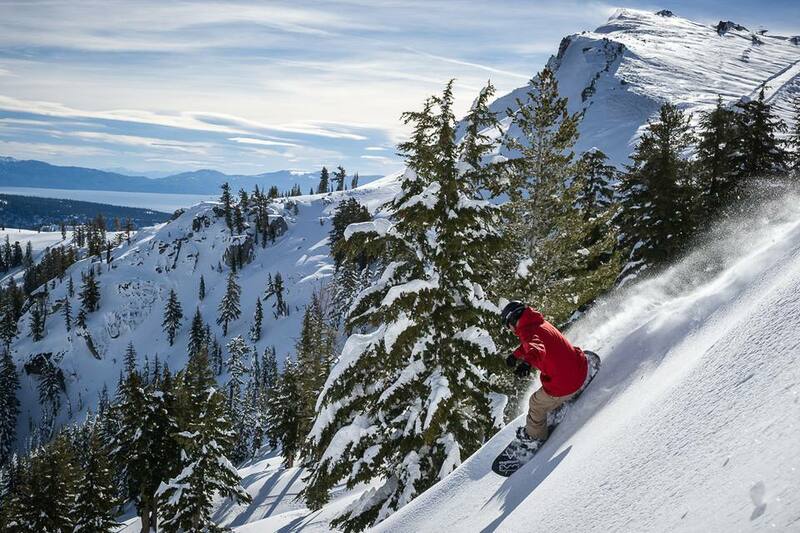 Lift tickets include access to both Squaw Valley and neighboring Alpine Meadows. Coffee Bar: This newcomer serves freshly baked quiches, sweet pastries, and breakfast burritos with enough kale to make you feel healthy. Wildflour: Tasty menu items include house-made tamales, spring rolls, and breakfast sandwiches. But you’re really here for the gooey, rich, Ghiradelli chocolate chip cookies—calories don’t count on the mountain, after all. Fireside Pizza: Snag a spot on the outside patio and order one of the house-made pies—creative toppings include Thai curry chicken; pears and gorgonzola; and smoky barbecue chicken. Don’t skip the garlic fries; they’re greasy, salty, and decadent in all the right ways. Rocker at Squaw: Creative takes on American comfort food—think heaping piles of nachos, crispy grilled cheeses, and brats served on naan—dominate the menu at Rocker, located just off the Funitel entrance. Le Chamois: The Chammy, as regulars call this aprés hot spot, has been serving house-made California-style pizzas (think BBQ chicken- or pesto-topped pies) and pitchers of beers since 1969. If you’re staying with a group or returning throughout the season, pick up one of three beer “Buddy Passes”: It’s $80 for 20 pints of domestic beers; $100 for 20 pints of premium brews; or $120 for 10 pitches of domestic beer. Plumpjack Café and Bar: Round out all those piles of nachos and stacks of cookies with a fancy sit-down meal. This upscale spot, located in the Squaw Valley Inn, serves clever variations on trendy dishes—think cocktails made with lemongrass-infused pisco; savory tarts made from foraged mushrooms; and ahi tuna poke served in pastry cones. Basic ski and board rental packages at the on-site center cost $60 (same-day) or $50 if you buy in advance. Performance packages from the demo shop start at $70 for boards and skis. One bonus of renting at the base: If your first run feels off or conditions shift, you can trade in equipment at any time. Start Haus: Locals know this spot for its expert boot fitters — they’re among the best in the country. Visit to buy a pair of ski boots, stock up on gear, adjust your own boots, or get your skis in tip-top shape. Squaw Valley offers group and private lessons for all levels of skiers and boarders (prices vary), as well as select specialty clinics (below); all lessons and programs include priority lift access. Women of Winter: Join a ladies-only ski group for a two-and-a-half-hour session on the slopes. Expert-level skiers can practice their skills on steep and bumpy terrain; intermediate skiers will work on confidently tackling black diamond runs. Clinics start at $49. The North Face Mountain Guides: Let experienced guides show you around some of Squaw Valley and Alpine Meadows' epic terrain and secret trails. Packages start at $819 for four guests, and everyone scores Thermoball Jackets by The North face. Squaw Valley is an unapologetic haven for winter-sports junkies, but less adventurous visitors will find plenty to do while their travel buddies are shredding up the mountain. Snow sports: Enjoy the snow without braving steep slopes: Slide down snow tube trails; cross country ski on a combined 21 kilometers of trails; snowshoe on designated trails; or even rent mini-snowmobiles for the kids. High Camp & Olympic Museum: Take the scenic aerial tram up to High Camp, where an outdoor pool, hot tub, and bar await (entrance costs $15). The high-altitude party gets going in the spring, when the pool opens and DJs spin during the day. For a more educational experience, check out the Olympic Museum, home to Team USA uniforms, ice skates, hockey sticks, and other athlete memorabilia from the 1960 games (admission is free with tram tickets). Yoga: Warm up your legs or stretch them out after a long day on the slopes at Wanderlust, the on-mountain yoga studio. The 1,000-square-foot space offers big picture windows that look out over the mountains—ideal for blissing out. The Village at Squaw Valley: Stay in one-, two-, or three-bedroom condos, all located at the base village. Many units have living rooms and full kitchens, making it easy for families to prep breakfast and lunch. Bonus: Each building has its own outdoor hot tub complex—many with dead-on views of the slopes. The Resort at Squaw Creek: This 450-room, ski-in/ski-out hotel claims its own lift, an outdoor hot tub and pool complex, and six restaurants and pubs. A free shuttle bus connects the resort to the base lodge. PlumpJack Squaw Valley Inn: Originally built as lodging for the 1960 Winter Olympic Delegation, this inn provides 56 rooms, studios, and suites near the base village.